The pertinent Beatles fact for "All I've Got to Do" is that this is a Lennon composition in which he once again confesses to imitating Smokey Robinson in songwriting style. The song was recorded September 11, 1963 at Abbey Road and was included on With the Beatles by Parlophone and Meet the Beatles by Capital. Lennon sings lead, and McCartney sings harmony. 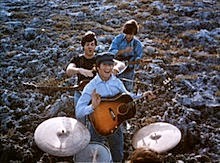 Lennon plays rhythm, Harrison lead, McCartney bass, and Starr drums.